At Ravasqueira, there is a concern and a thirst for the challenge of producing innovative, differentiated, and disruptive wines. In this range, three very special wines are included, either by their method of production or by their method of vinification or viticulture. Three wines that aim to, above all, surprise consumers and cause strong emotions that make your tasting experience a memorable moment. This is a wine made exclusively from grapes of the Alfrocheiro variety, harvested by hand and produced according to the traditional method, with the second fermentation in bottle, where it staged on the lees for 36 months. It presents a Brut Nature style because that is the best way to express all the potential of the caste and the terroir it is planted in. This wine is the result of an exercise in dedication, passion and art, as was the case with the ancestral carpets of Arraiolos, woven at Monte da Ravasqueira since the beginning of the 16th century and that are honoured through the graphic elements present on each bottle. When tasting, it is complex, with a very lively acidity and a very fine bubble, with notes of crystallised fruit and biscuit. 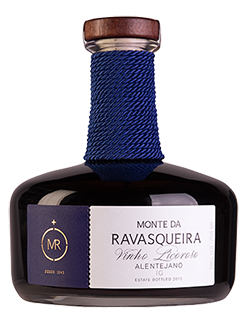 The innovative spirit and passion for the art of oenology that is sought to be imprinted at Monte da Ravasqueira lead to a constant search for quality and creativity. That is how this liqueur wine came to fruition, a defiance in the face of the region’s wine tradition, but which reflects the commitment to the values of Ravasqueira and that strengthens the richness and excellence of the Alentejo. For the production of this wine, stocks of Touriga Franca, Touriga Nacional, and Tinta Roriz were selected from specific vine areas. Deep ruby colour. Stylised, elegant and fine nose, with fresh and intense aromas of black currant, cherry, blueberries and notes of liquorice, rosemary and light spices. The proof is full of concentrated, rich black fruit with very elegant tannins, but firm and well integrated. It shows great balance and delicacy with a focus on the varietal expression of the Tourigas. This is the result of a rigorous monitoring of the maturation of the Viognier grape clusters, which were harvested and subjected to a conservation and freezing process in order to produce a wine that shows a modern profile representative of the differentiation of the Monte da Ravasqueira vineyard. Grapes are carefully collected into boxes and placed in a refrigerator, at temperature of -20ºC for a few weeks, in order to concentrate all of the caste’s rich flavours, sugars and natural acidity. A selection of the clusters is made, followed by a slow and smooth pressing of the frozen grapes for more than 24 hours, resulting in a production of only 2,500 litres. Yellow, lemon in colour with greenish tones. Complex matrix of a blend of ripe citric fruits with guava, tangerine peel, quince jam, honey, and pineapple in syrup. Fat, but fresh with intense grapefruit. Rich and full to taste. Sweetness in constant balance with the acidity and without overlap. Mineral, with unusual texture, it goes perfectly with cheese appetisers, dry fruits and patés, or with fruit-based desserts. Can also be drunk alone.